A couple of weeks ago I published the recipe for the basic Atole or Atol, and, as mentioned, you can use that recipe as your base and add fruits, seeds or other ingredients to change its flavor. 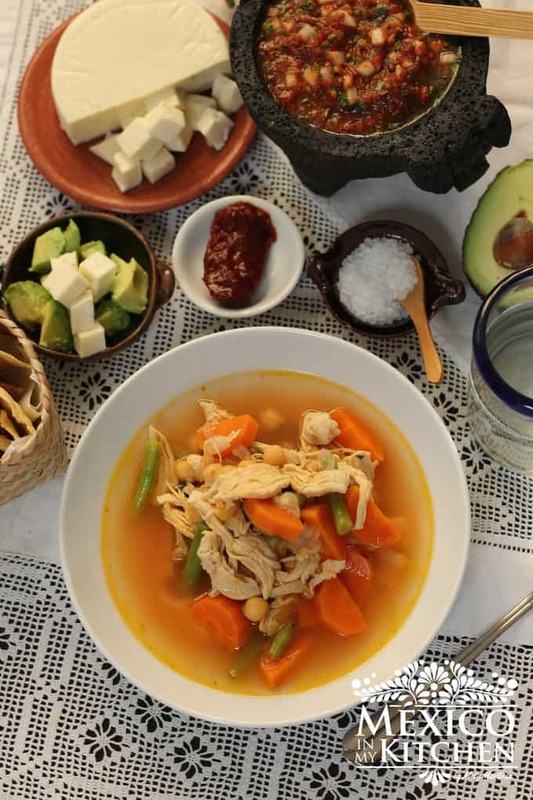 Today’s recipe is a very popular one in the central states of Mexico, like Guanajuato, Michoacán, Estado de Mexico and Mexico City. Although it is usually made using corn dough to thicken it, you will also find it now being made with corn starch. The white atole with milk and guava pure are a delightful combination. Guava is a very aromatic fruit, guavas grown in Mexico have a light yellow skin with small brown spots once they are ripe the pulp is soft and white and some are light pink, they have a large number of small seeds. Guava’s taste is sweet and a little bit bitter. Guavas are largely popular during the Holiday season because they are part of the ingredients for our famous Christmas Punch, the Buñuelos Syrup, and even found in the Christmas Salad. But today, you can find them sold year around, and people eat them raw, as you will eat any fresh seasonal fruit like apples, pears, oranges, etc., poached in a sugar syrup, in agua fresca or to make Guava paste (Ate de Guayaba). Personally, I love to add them to my kefir or yogurt and mix in the blender. If you like kefir with fruits, I am sure you will like it with guavas. If you don’t find the fresh guavas in your area, look for the canned version, they are also a good substitute for making this Atole or other recipes mentioned above. My Grandma had Guava trees on her farm, and growing up, my brothers and I used to climb the trees to eat guavas up there hanging from the branches. I don’t know why, but there was a guava tree that had cactus (nopales) plants surrounding it, getting up there was really easy, but coming down the tree was a different situation. So we stayed up there as much as we could, eating guavas, some were not even ripe yet, we ate them unripe, still green and we seasoned them with salt. If you haven’t tried guavas, give them a try, they are full of fiber and vitamin C.
Now let’s do some cooking! In a small bowl, mix the cornflour 1 cup of water. Stir well to avoid any lumps. Once the milk comes to a boil, slowly whisk in the cornflour mix and bring to a boil again. Then, reduce heat to medium-low and keep simmering until thickened about 8 minutes. Stir occasionally. Remember, you will not add the puree until the Atole is almost cooked. While the atole is cooking, place the guavas in a blender and process until you have a smooth puree, seeds will still be whole, pass thru a sieve or colander. (See notes above about making the puree). Stir guava puree into the cooking atole. Mix well and keep cooking for about 10 more minutes. Although it is not a traditional way to do it, I like to serve this type of atole with a dusting of ground cinnamon. The white atole with milk and guava pure are a delightful combination. Guava is a very aromatic fruit, guavas grown in Mexico have a light yellow skin with small brown spots once they are ripe the pulp is soft and white and some are light pink, they have a large number of small seeds. Mix milk, sugar, and cinnamon stick in a saucepan. Turn heat to medium and simmer. ** Substitute fresh Guavas for the canned version if fresh ones are not available. You can first remove the seeds of the guavas and then puree in your blender for step 4. That way you can skip the use of a colander or sieve. DO NOT ADD the guava puree until the atole is almost cooked, otherwise, the milk will curdle. You can store any leftover atole in the fridge for several days and just reheat again. Some people even freeze the atole for weeks. For other atole recipes click HERE. Do you use only the inside of the guavas? You only need to remove the seeds, you use the flesh and skin.